Muckers is coming to Z-arts! Award-winning theatre maker Caroline Horton brings Muckers to Z-arts, a funny, physical production for 5+ and their grown-ups. Bright lights, physical theatre, and lots of wigs – Muckers comes to Z-arts on Saturday 13 April! Paloma has always mucked about with Pijon. They love it. They run wild, dressing up like tigers, flamenco dancers, queens, kings, rabbits and Lady Gaga. Everything. Life is fun and funny and a little bit loopy. 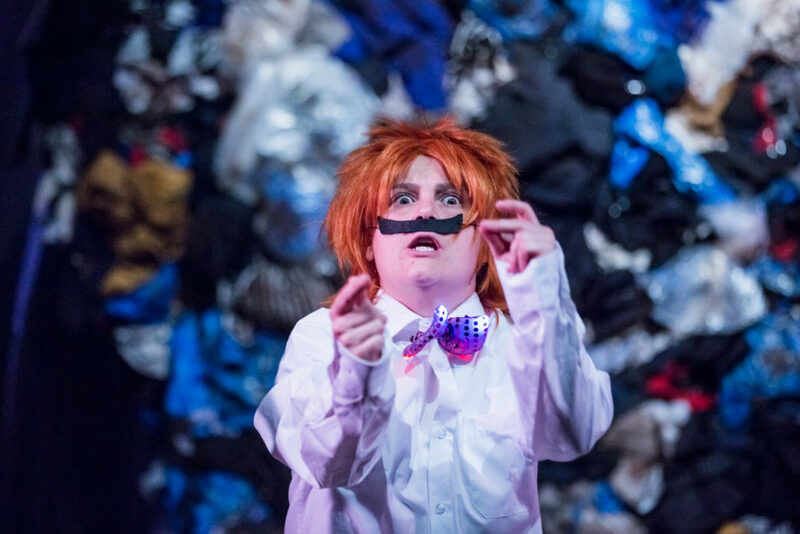 Using original songs, physical theatre and a lot of costumes, Muckers is perfect for anyone who has ever been told off for mucking around. All of a sudden, Paloma comes face to face with a blinding light named Big Luce. She doesn’t understand what she’s done wrong but Big Luce just won’t leave her be. Paloma and Pijon are catapulted into a strange new world where they begin their surreal adventure, determined to find out what Big Luce is all about. Olivier-award nominee Caroline Horton’s brand new show is irreverent and relevant, inviting the audience into a world of mess and imagination. Muckers has an international ensemble and a universal message – stand proud and be true to yourself. Caroline Horton is an award-winning theatre maker. Her work is, in her own words, “funny, stupid and profound – often wild – often personal – sometimes political”, and Muckers is her first ever show created specifically for a younger audience. The idea for Muckers came about when Caroline was living in Madrid. She was fascinated by the strength of Spain’s vibrant feminist campaigns against the backdrop of its historical machismo, and with this contrast she could clearly see the context of the equality movement in the UK. The show is an international co-production. It combines the brilliance of the Oxford Playhouse, iconic Madrid-based cultural institution Conde Duque and Welsh touring company Theatr Iolo, and is directed by acclaimed Spanish theatre, television and film actor/director José Troncoso. This show continues to change the conversation around what children’s theatre can be – come and see for yourself! Muckers is suitable for 5+ year olds and their grown-ups. The show is at 2.30pm, and tickets are £6-9 – click here to book!